KMF Managing Director Gareth Higgins has been awarded an MBE in the Queen’s Birthday Honours list. Gareth, who has helped to steer KMF through 25 years of growth, is honoured for services to apprenticeships. 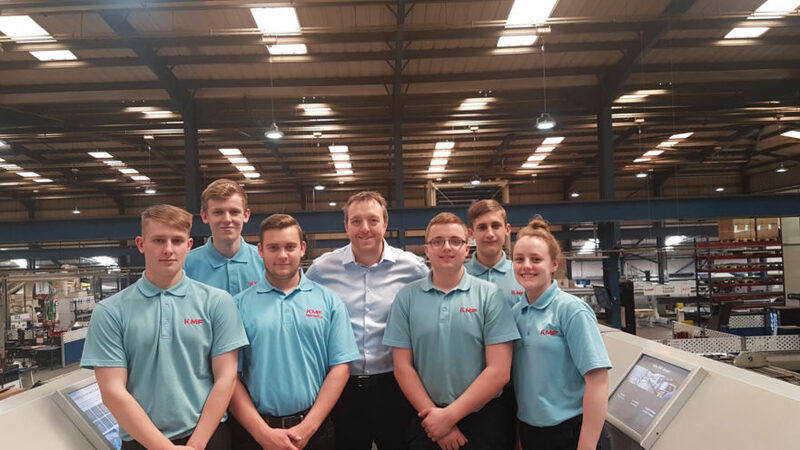 North Staffordshire based KMF has gained a national reputation as a leader for apprenticeship and training, supporting young people into a successful career in engineering. KMF invested £600,000 to create a purpose built training centre in 2009 and has trained more than 60 apprentices providing skilled employees for the company and a chance for school leavers to gain high level qualifications and a long-term career in the engineering sector. This year alone, 16 young people will start their apprenticeship with the KMF Group. Gareth said: “It is an incredible honour to be nominated for an MBE but to be recognised for KMF’s commitment to skills and engineering makes this particularly rewarding. KMF has gained many accolades for its apprenticeship programme and its award winning “Young Engineer of the Year” programme which works with schools, colleges and businesses to inspire interest in engineering as a career. KMF was founded by Gareth’s father, Mick Higgins, in 1971. After a short career serving as a Royal Navy Weapons Engineer. Gareth joined the business in 1992 initially in the sales and customer service team before learning all of the aspects of the business under his father’s watchful eye. In 2009, Gareth became Managing Director and he has led the company through a period of considerable expansion. KMF currently has 225,000 sq. ft. of manufacturing facilities and employs over 500 staff, establishing it as the UK’s largest and most successful precision sheet metal fabrication company.